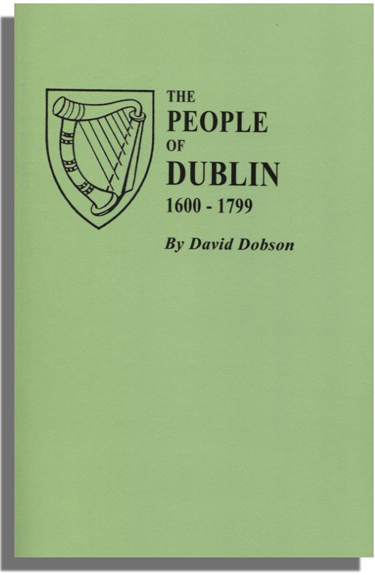 This genealogical source book by David Dobson identifies some of the inhabitants of Dublin between 1600 and 1800 who would otherwise be difficult to situate. It is based on primary sources found in Great Britain and Ireland as well as across the Atlantic. The sources include the Huguenot Society Publications; the Calendar of Patent & Close Rolls Ireland; records found in the State Paper Office, Dublin; the National Library of Ireland; and many more. Information on each of the 2,500 Dubliners in the volume includes the full name, occupation, a date, and the source, but on some occasions the entries also name family member(s), date of marriage or death, military theater served in, and additional information.